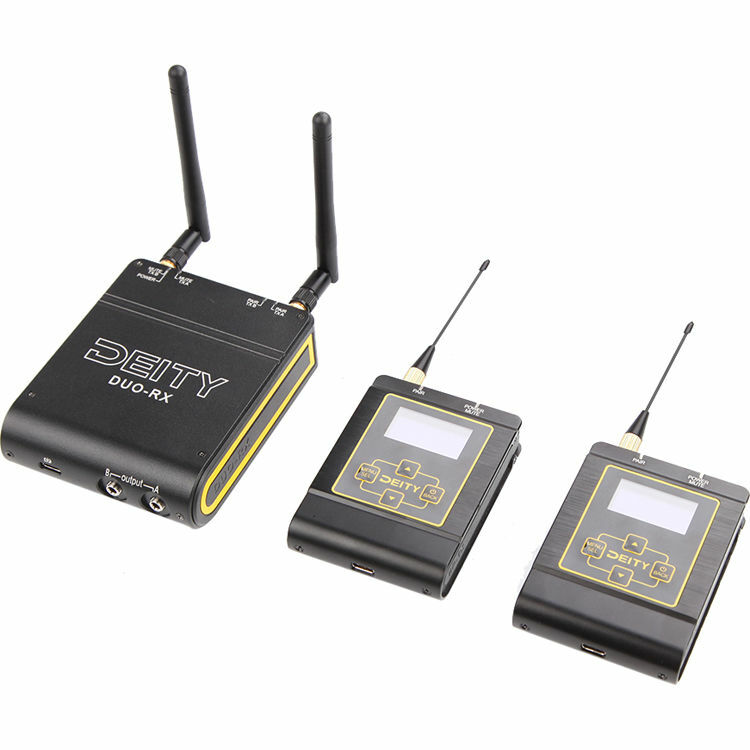 Leave the UHF band behind and break into pro-level 2.4 GHz operation with the sound bag-ready Deity Microphones Deity Connect, a dual-channel, true diversity wireless system offering a host of high-end features and everything you need to produce broadcast-quality sound for your next film shoot, television project, or video production gig. Whether you're tasked with electronic news gathering, recording interviews, or capturing speeches at conferences, the Deity Connect empowers you with the advanced technology, rugged durability, and extensive customization requisite for dependable, high-grade results. Knowing that a strong and solid audio link is crucial for professional results, the Deity Connect was designed as a bidirectional transceiver system with adaptive frequency hopping, "Listen-Before-Talk" stream repair, and encrypted, uncompressed digital signal integrity. The receiver sports four antennas—two internal dipole horizontal antennas, and two external elbow antennas—to allow versatile positioning and deliver uninterrupted signal reception. Through its OLED screen and straightforward buttons, the receiver provides comprehensive remote control of each transmitter; no more walking over to your subject to adjust transmitter settings! There are two gain-adjustable 3.5mm TRS outputs, which can be utilized in any of the three output modes—Balanced XLR mode sends a separate audio channel as a balanced signal to each output jack, DSLR Blended mode mixes both audio channels to one output and turns the other jack into a headphone output, while Stereo mode routes a stereo feed from each transmitter to separate outputs.In addition to having the same OLED screen and user-friendly menu navigation as the receiver, the transmitters grant thorough control of your signal quality via automatic or manual RF power adjustment, switchable analog limiters, low-cut filters, and high-frequency boosts; tame peaks, reduce rumble, enhance clarity, and more! The locking 3.5mm TRS input jack on each transmitter conforms to the Sennheiser-standard pin configuration, and can be set to accept a mono mic signal or a stereo line-level source for camera hopping. The transmitters and receiver boast 10 hours of operating time at 100mW (more time at lower mW settings) via internal lithium batteries, which recharge in about an hour via USB Type-C connections. If you want efficiency and versatility without sacrificing quality, make the Deity Connect your wireless audio solution.